1. Keep it simple: Hang a candle box on the wall. 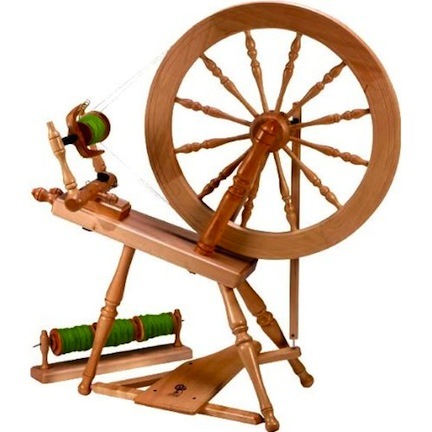 Find a super antique spinning wheel. Hang bundles of dried herbs. 2. Keep it natural: Twigs twined into wreaths, pinecones or apples piled in a wooden bowl, hand-made tapered candles. 3. Think hand-made and unique: The last thing you want is for your home decor items to look mass-produced, new (as in contemporary) and matched (as in furniture suites). One option is to make some simple items yourself. After all, “hand-crafted” by you is appropriate to both the independent spirit and the necessary thrift of American Colonial life. 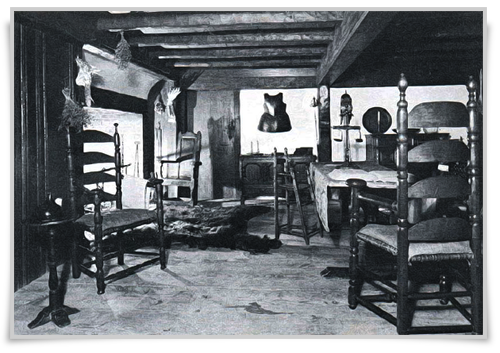 Artist’s Conception of an Interior of a New England settler’s home in the 17th century, after an illustration by George H. Boughton (litho), American School / Private Collection / Peter Newark Pictures / The Bridgeman Art Library Available at AllPosters.com in a variety of sizes and formats. 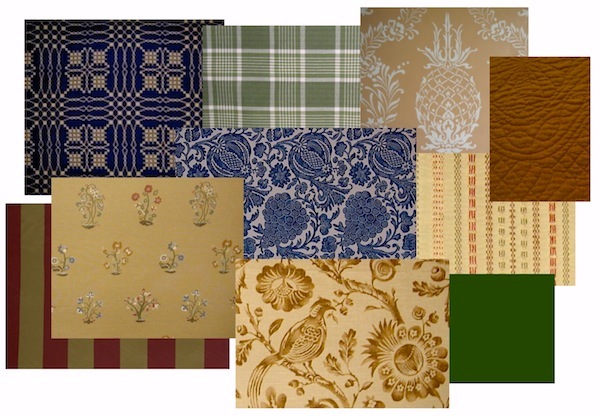 As you can see clearly in the illustration of motifs in Part 1, samplers and embroidered designs were the source of many of the most popular motifs of Colonial America, as were the decorative stenciled designs used on earthenware and weaving and quilting patterns. Bear in mind, however, that only those colonists who had the wherewithal to have the leisure to spend time on needlework or quilting or to have someone else do such handiwork would have had fancy woven coverlets, quilts, cross stitch, crewel or tapestries. The early settlers and common folk would have had more simply and sometimes crudely made “bed rugs” or coarse blankets for warmth. 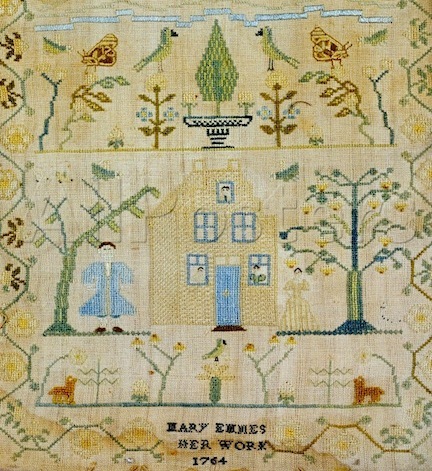 If you Don’t have a Family Heirloom Sampler, Why not Create One? 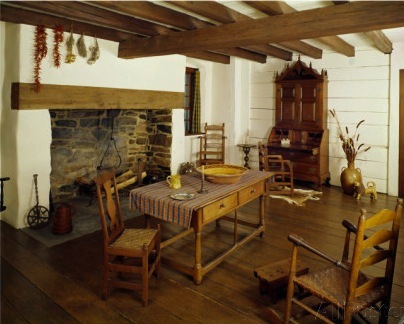 Most colonists used simple wood or iron candle holders, usually placed on a table but sometimes mounted on the wall. The more prosperous would have used chandeliers (with candles) hand crafted from brass, pewter, or iron. Candles were made of tallow (rendered animal fat) and, later, bayberry and beeswax. In the 1600s, pilgrim and puritan housewives hand-dipped candles using the natural material found in all the colonies, the wax-like berries of the bayberry bush which came to be known as the Candle-Berry Tree. Biedermann and Sons recreates these candles with traditional techniques that make the 6 pairs of candles included in this set. Biedermann and Sons has specialized in unique candles and decorative accessories since 1956. For centuries, tapered candles have been formed by meticulously hand-dipping. Root takes this traditional process to another level by continuously dipping our tapers to create up to 35 individual layers of wax. The result is a satin-like finish with solid, consistently colored, unscented wax throughout. Our timeless observation: You can’t rush perfection. 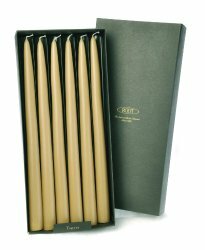 Box of 12 candles, each 12-inches tall with a burn time of 12 hours each. 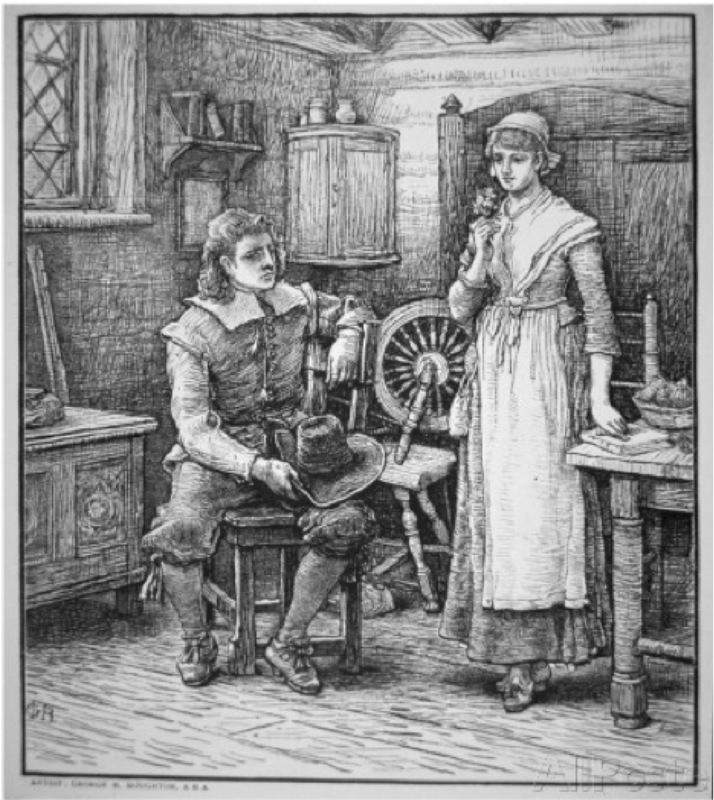 From the 1600’s to the 1800’s… If a young gentleman looked OK with the colonial father, the candle was placed high up when lit so that the daughter and young man had a lot of courting time… If Dad had any doubts…the candle would be placed lower in the spiral and be extinguished sooner. When the candle burned out, the “date” was over. 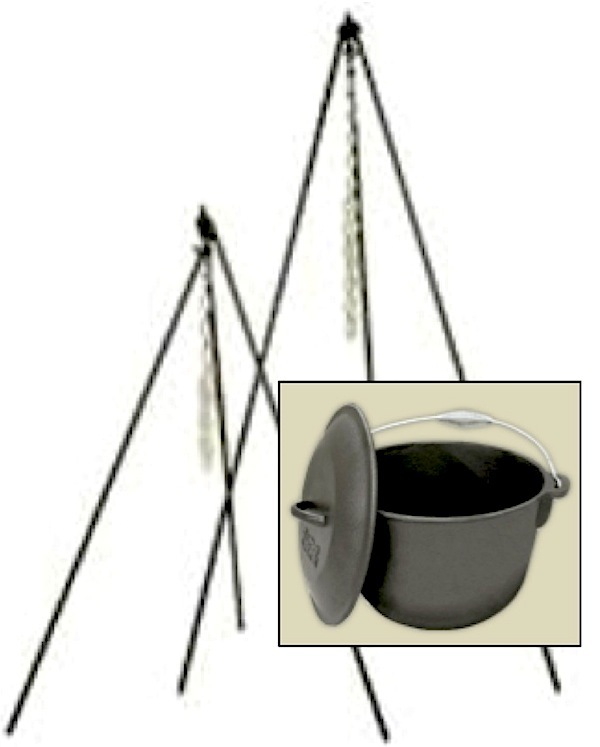 6″ wide and 6¾” high. Fits a standard taper candle. 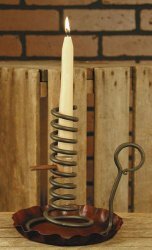 Includes rustic pan, spiral courting candle holder, wooden hammer gauge and a free pure bees wax candle. 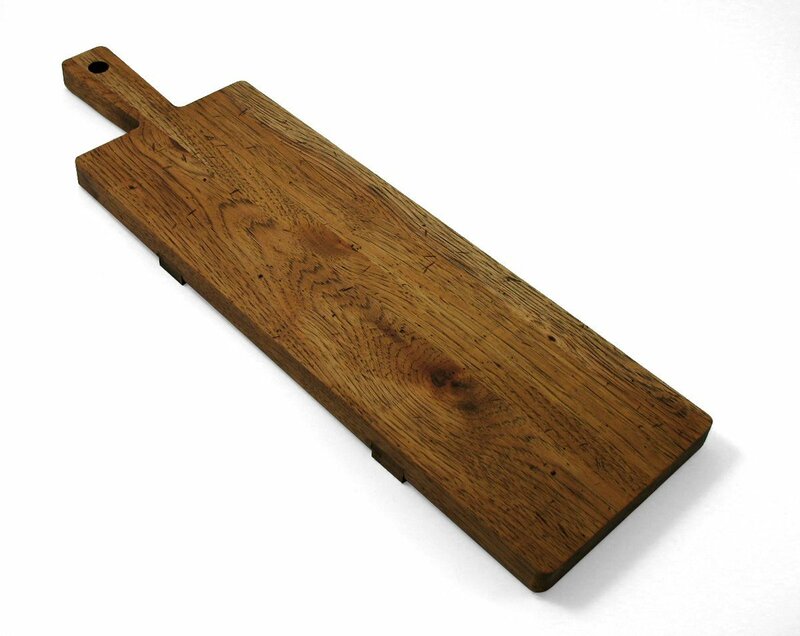 ~ Handcrafted and finished in Vermont, U.S.A.
with Loop Handle. Also Available in Other Sizes. 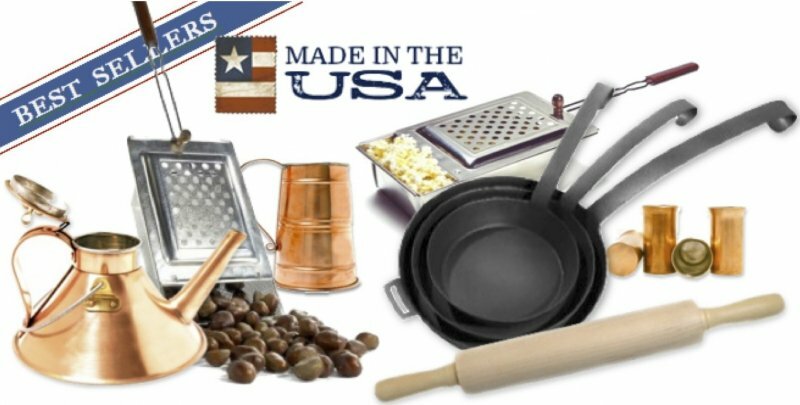 The oldest cookware in America made with traditional methods for over 200 years. Left to right: Pioneer tea kettle, chestnut roaster, Ben Franklin stein, healthy popcorn popper, frontier frying pans, Homestead rolling pin, and Old West shot glasses. All from Jacob Bromwell.